From whatever hardened silo complex outside Auchtertool in which they had been nursing his wrath to keep it warm, the Hootsmon launched their secret weapon of Irn Broon full-frontal-page yesterday. For a man who can make the word ‘dour’ look like carnival in Rio by comparison, it was not the highlight of anyone’s day, but at least the man is consistent. Presenting the annual Donald Dewar lecture at the Edinburgh International Book Festival, Mr Brown performed the now-familiar unionist rain-dance that Scotland would all but slide beneath the waves, were it not for the solid rock of the Union to keep it afloat. I looked hard for anything new being said but it really did consist of a stark choice between business-as-usual under Westminster’s wing or fiscal oblivion. Now, whatever you may think of Gordon’s politics or even his tenure at No 10, the man’s not daft, nor can he be without ability to thole Blair as a boss and hoodwink an entire nation (two, actually) into thinking his girlfriend Prudence had put the hex on boom and bust. If I sound bitterly cynical, it’s because I believe he—more than any—was asleep at the financial switch and so allowed UK banks to grow as greedy as the late (un? )lamented Lehman Brothers, bust through hubris despite their $639bn in assets (roughly the size of the whole UK economy). Yet so major a figure would not come out of retirement to flap his lip just for the exercise or nostalgia for the limelight. Do his assertions that keeping the pound would be ‘a colonial arrangement’ and would continued union offer a far safer path into increasingly uncertain futures? Let’s look at background figures, published in the spring by Eurostat (I thank Andrew Wilson and his ever-astute (excepting where Motherwell FC is concerned) observations on events for drawing my attention to their detailed tables). 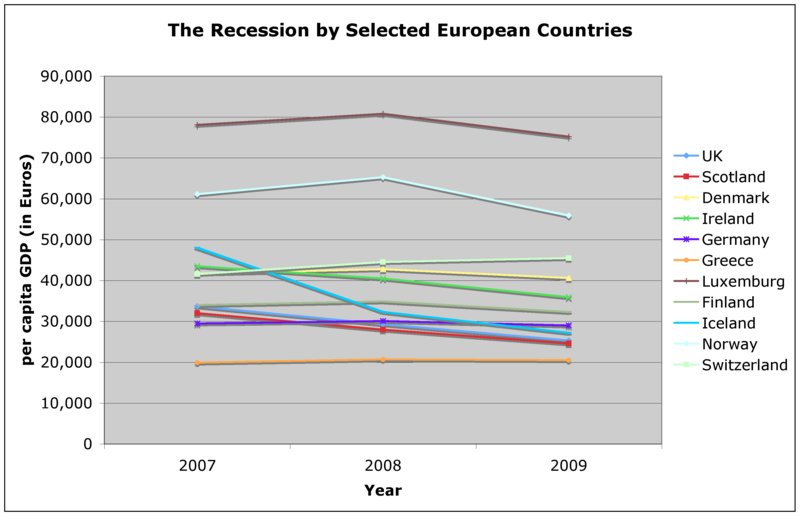 They provide statistics how this recession has affected Gross Domestic Product per capita, broken down not just by country but by relatively small economic region across Europe. We hear today how Portugal’s economy has shrunk 1.5% in the last 3 months, even as Germany alone pulls off a small growth. We are all (as Cam might put it) in the mess together, no? However much Irn Broon may regurgitate the bettertogether mantra of fiscal apocalypse at the gates, the implication that the UK is a financial life-raft for impoverished Scotland, whose continued survival involves clenching both eyes and nurse’s hand, should hold water when examined under the objective microscope of detailed Euro-based stats, no? Let’s examine the story within the UK. How hard has the recession hit us and how evenly has its impact been spread? 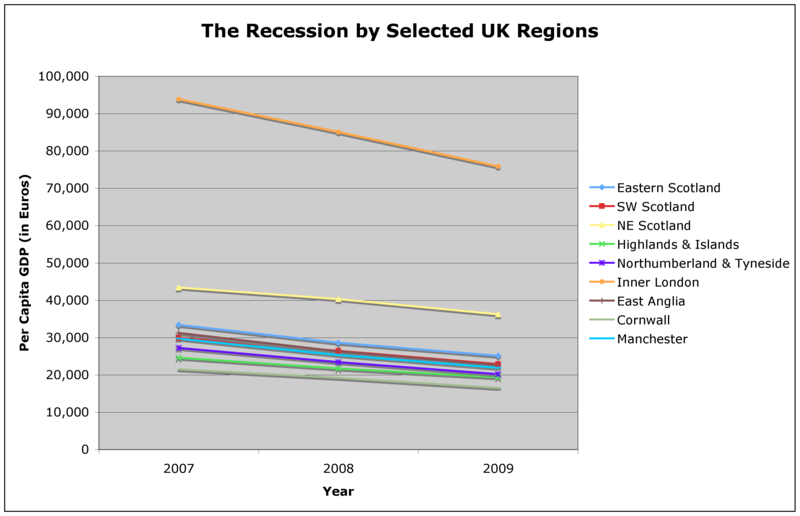 Looking at selected regions across Britain (with Scotland’s four regions compared to representative ones in England) gives a fairly consistent tale of how the recession affected GDP per capita in each area. 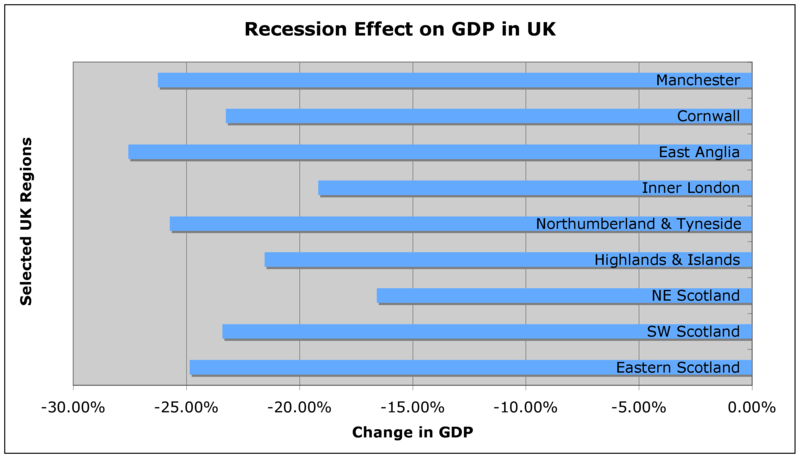 Note how all regions show a consistent pattern, no matter which part of the UK, with Inner London keeping its clear lead in GDP through financial services and NE Scotland through the barely-affected Oil and Gas sector . Looking at the before-and-after change shows how serious this has been but that we are all roughly in the same boat. This shows that, although both Inner London and Aberdeen can be said to have weathered the storm best, everyone is pretty much in the 15-25% loss boat. In such dire times why would you think of casting yourself adrift in such stormy seas? Well, because there is another story going on—one that both media and UK government seem reluctant to relate. While they are always prompt with dire news from the Continent, brought to us with much wailing and gnashing of teeth about how our biggest markets are there, so how can we possibly escape this recession, the news is rather at odds with that glum picture. Not only have the PIGS yet to grunt—let alone croak—but the figures are not what you would extrapolate from the UK stats. Chart 3 is the Euro-equivalent of Chart 1 above. Doesn’t that look pretty much the same? Well, no, it doesn’t. Note both the UK (light blue) and Scotland (red) are slashing down to the right much steeper than most others except Iceland and Ireland. In fact, Switzerland and Greece appear to be rising. Looking at the European equivalent in Chart 2 in Chart 4 below highlights this. This looks nothing like Chart 2. 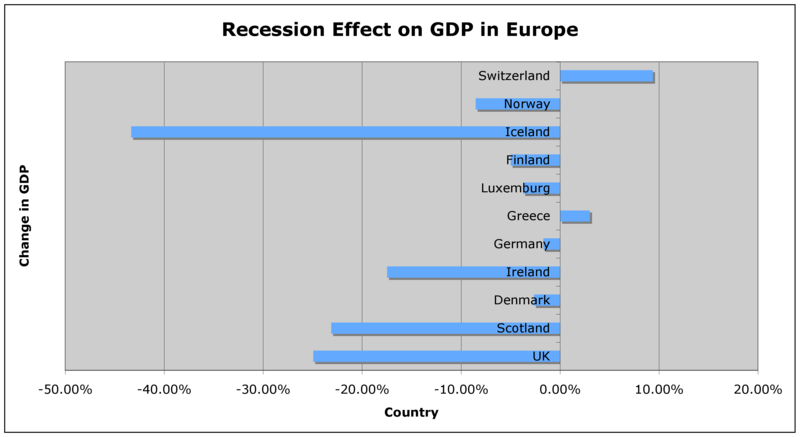 In other words, a slew of European countries are riding out this recession with far less damage than the UK. In fact, the only countries sharing the dire 15-25% falls uniform across the UK are Iceland, whose banks were one of the few worse examples of hubris and overstretch than those of the US and UK, and Ireland, which is suffering the bursting of a property bubble that made London house price rises in the eighties look modest. Elsewhere in Europe, the equivalent to the UK’s major stumble is nowhere to be found. The worst is Norway, whose GDP ‘dropped’ 8.5%—from 1.9 times ours to 2.3 times ours. Oh to have such ‘problems’. With statistics like that, is it any wonder that our European neighbours regard Britain as the sick man of Europe and get thoroughly fed up with Tory party backwoodsmen bleating on about sovereignty and hankering after halcyon days when Johnny Foreigner could be brought to heel with a well deployed gunboat? These figures make any objective observer ask why a country in Scotland’s position would want to remain tied to a country run by such inept fiscal controllers—as Brown proved to be—and not establish itself as one of a body of progressive countries nearby that are clearly making a better fist of weathering the current fiscal storm than the UK is. Despite its front-page coverage, what Gordon Brown was peddling yesterday was hokum. It was unsubstantiated scaremongering that simple research such as above disproves with the click of a mouse. None of the assertions made in the Hootsmon were substantiated—we just had to take Gordon’s word for it. Instead of the nuclear strike on arguments for independence that this ICBM deployment had intended, it was, to mangle a phrase from Westminster itself, like being savaged by a damp squib. This entry was posted in Politics and tagged independence; finance; europe; Gordon Brown. Bookmark the permalink.